Do you have a Shoulder Separation diagnosis, or are you wondering if your severe shoulder pain is from a separated shoulder? What is a Seperated Shoulder? Different from Shoulder Dislocation, Shoulder Tendonitis, and Shoulder Subluxation, a separation of the shoulder is a specific kind of injury. It has nothing to do with the shoulder joint per se, and specifically is a separation of the Acromio-Clavicular Joint (AC joint). And as you know if you've ever had a separate of the shoulder ac joint, it's no fun. Not officially considered to be part of the shoulder joint, the AcromioClavicular joint is the structure where the Acromion (top part of the shoulder blade bone) meets the Clavicle bone. ** Google 'shoulder anatomy acromion' and look at the joint structure. The joint is held together by cartilage and ligament and connective tissue. Usually from a fall or other impact injury, the joint, the bones, can separate. This can cause severe arm and shoulder pain. As the AC joint of the shoulder separates, depending on the force of the impact, the ligament holding the bones together can stretch and tear (this can leave them permanently lengthened, just the joint is not held together as tightly). This separation of shoulder bones can cause A LOT of pain, and can take a long time for the pain to go away. And if the structural integrity of the joint is destroyed, that can be problematic for the future. How Long Before A Shoulder Separation Heals? How long does it take a Shoulder Separation to heal? You can have a minor, low level separation, or a major, high level separation. This basically means that you can separate the joint a little or a lot. The more separation there is, the more pain you'll have, and the longer you'll have pain and problem. And the higher the potential for future problem. A low level separation means the the body felt pain, noticed that there was an injury, kicked in a Pain Causing Dynamic, and may very well eventually just 'heal' which includes the pain going away. A high level separation means that the ligament got torn and/or stretched. Surgery may be recommended to repair the joint structure. Keep in mind that if the joint capsule and ligament are stretched, it's highly likely that the AC joint will never heal back to being as strong and stable as it was before. Just resting the shoulder and 'giving it time' may or may not allow the body to heal damage from an AC separated shoulder. You can help your body heal faster that the default rate. The other problem with 'healing' a separated shoulder is Inflammation, and then generally keeps pain around far longer than any injury deserves. If you want to help your body heal faster from a separated shoulder mild or severe (especially after separated shoulder surgery) then you need to follow the icing instructions on the How To Reduce Inflammation page. And the shoulder being a tough place to effectively ice, you may want to consider the Cold Therapy System. And on a whole other level, there's The ARPwave System. Shoulder Separation is no joke, at either end of the spectrum. It can set you up for pain and problem later, including Shoulder Tendonitis and having an unstable, loosely held joint. Educate yourself and learn what you need to learn to keep the overall structure well strengthened and supported. The danger of a shoulder separation causing a Tendonitis is 100%. That's just how the body responds to pain and in jury. 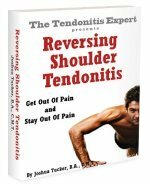 Make sure you understand all the factors of the Tendonitis dynamic. See: What Is Tendonitis? Return to the top of this Shoulder Separation page.